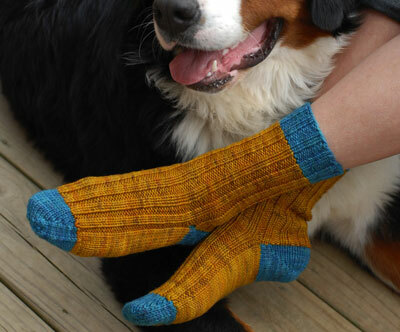 You can work this sock on any multiple of 4 sts. Length is adjustable. Round 1: * K2, p2 *, rep from * to * to end of round. Start these top-down socks with the cuff and leg. CO 48 (56) sts in CC with larger needles. Divide evenly over four dpns and join for working in the round. Place a marker for beg of the round. Work 1.75 inches of 2 x 2 Rib. Change to MC and work 1 more inch of 2 x 2 Rib (2.75 inches total). 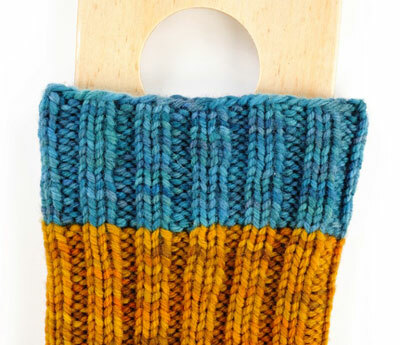 Switch to smaller needles and continue even in 2 x 2 Rib until piece measures 8 inches. Change to CC. Work the heel over 24 (28) sts. Row 1: Knit 23 (27), wrap the next st and turn. Row 2: Purl 22 (26), wrap the next st and turn. Row 3: Knit to 1 st before gap, wrap the next st and turn. Row 4: Purl to 1 st before gap, wrap the next st and turn. Repeat rows 3 and 4 until 8 (10) sts rem unworked in the middle of the heel. Pick up wraps and work the foot. Row 1: Knit to the first wrapped st. 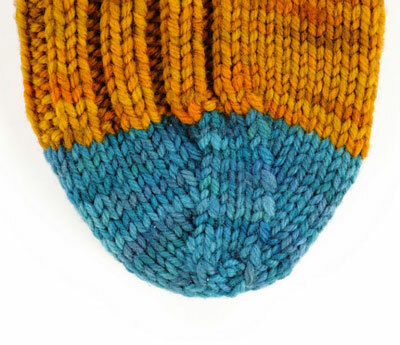 Pick up wrap and knit it together with the st. Wrap the next st and turn. Row 2: Purl to the first wrapped st. Pick up wrap and purl it together with the st. Wrap the next st and turn. 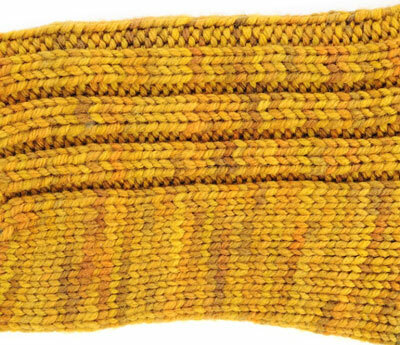 Row 3: Knit to the double-wrapped st. 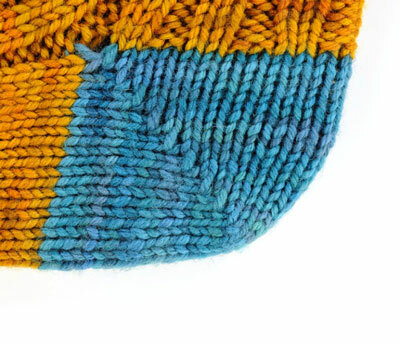 Pick up both wraps and knit them together with the st. Wrap the next st and turn. Row 4: Purl to the double-wrapped st. Pick up both wraps and purl them together with the st. Wrap the next st and turn. Repeat rows 3 and 4 until you have worked all heel sts and worked all the wraps together with their respective sts. Round now beg at the center back heel. Continue even in patt, maintaining 2 ¥ 2 Ribbing over instep and St st over sole. Work foot to 7.5 (8.5) inches from back of heel (or 2 inches less than desired length). Needle 2: K1, ssk, k to end. Repeat rounds 1 and 2 until 24 (28) sts rem. Repeat Round 1 only until 12 (16) sts rem.